It has been a few years since I wrote Reloading 101 and I have commented several times that I should update it. Well I guess now is as good a time as any. This mental wandering is not comprehensive, it is “in addition to” the previous article. As always YRMV, IMHO, and other such bits as are required to ensure that you understand this is a thinking man’s game and I am merely making observations and defining MY experiences. <span style="font-weight: bold">New Tools of the trade:</span> I linked to the manufacturer’s web site, as always you can shop for the best price at the usual suspects. Hornady Sure-Loc-Lock Rings: Something as simple as a well designed piece of equipment can make a huge difference in your happiness factor when reloading. These lock Rings are simply the best in my opinion. The ring is a “compression” type in that it clamps around the die so that there are no set screws going into your dies, rubber o-rings or other such things. The best part is the wrench flats, a simple modification to a “normal” ring that makes a huge difference in usability. <span style="font-weight: bold">Stoney Point (now Hornady) Comparator Set:</span> This comparator set is the tool for measuring the ogive length of your rounds or the bullets themselves. The set comes with various insert for various bullet diameters. It clamps directly to your caliper and depending on your skill with calipers is very accurate. This tool is as essential to me for producing precision ammo as is the press. Remember when using this tool that your measurements will increase by 1” +/- due to the size of the tool. <span style="font-weight: bold">Stoney Point (now Hornady): Head and Shoulders gauges: </span> This simple bit of kit allows you to measure the headspace of your firearm via a fired case on your dial calipers. The set comes with various inserts that allow multiple cartridges to be investigated. The additional obvious benefit to the reloader is that it will allow you to precisely set up your dies to a known measurement as opposed to the abstract of “the bolt closes smoothly”. As above, the length of the tool must be taken into account when recording the length. <span style="font-weight: bold">Hornady Lock n Load Bushing Set:</span> The set consists of a bushing that you lock into your single stage press and three die collars that you screw/lock your dies into. It requires that your press has the 1-1/4 X 12 TPI opening (most single stage presses today have a bushing that can be unscrewed). This system is a Godsend and a pain all at the same time. The good part is that once you have all your dies set up the ability to change calibers is a simple twist of the wrist. The pain part is re-setting all of your dies to take advantage of the system. 10 packs of extra collars are available. I use paint or marker witness marks to ensure that the collets are fully turned into the bushing. <span style="font-weight: bold">Redding Competition Shell Holders:</span> Redding makes a high precision set of shell holders that allow you to adjust the “crush” of the resize die or the tension of the seating die by simply changing the shell holder. The set consists of 5 shell holders: .002”, .004”, .006”, .008”, .010”. I set my dies up with the .006” shell holder, this allows me to add or subtract depth up to .004” from my “zero”. This is especially handy if you are reloading for multiple rifles of the same caliber and keeps you from resetting your dies for each. These shell holders are precision tools and are “snug” when pressing into your press ram. They may need a bit of “persuasion” to get into the ram. <span style="font-weight: bold">Innovative Technologies Magnum Collet Die:</span> This die has been around for quite some time but I’m finally adding it into the mix for all the belted magnum shooters out there. Historically magnum brass will refuse to chamber after 3 – 5 reloads because of the expansion above the belt that factory dies will not fix. The concept of this die is as simple as it is effective. The die and collet allows you to squeeze the brass above the belt back down to “factory” size. The top of the die is a “brass checker”, basically if your brass fits you don’t have to size it. If it doesn’t, lube a case, slip on the collet and run it into the die. The instructions recommend Imperial Sizing wax as a lubricant. I have found that spray on lube’s are MUCH better. Probably because I did something wrong with the wax, the result was ripping off case heads and beating the brass out with a section of military cleaning rod. No matter how you go about it this die is a MUST HAVE for a belted magnum cartridge shooter that wants to get more than a hand full of loads out of their brass. NOTE: You will have to mount this die each time if you are using the Lock N Load Bushing Set since the base will not fit through the bushing on the press. Fortunately the set up is rather simple and doesn’t require precision location. <span style="font-weight: bold">Sinclair Chamber Length Gage:</span> This tool provides you the means to accurately determine how long the neck of your chamber is. It is simply a plug that is inserted into a shortened case that indexes at the end of your chamber. This will tell you how long you can let your brass “grow” before you NEED to trim as opposed to using the arbitrary “factory case length” numbers in a reloading manual. As with most things factory, chamber length is usually much longer than specification. <span style="font-weight: bold">Saturn Powder Funnel:</span> These powder funnels are simply the best that I have used. Due to the design, the funnels are sized so that you have to buy one for each caliber you are loading for. I find this a small price to pay for the resulting performance compared to a “universal”. <span style="font-weight: bold">Sinclair Gen II Flash Hole Reamer:</span> In response to my major complaint that the RCBS flash hole reamer would get bound up with brass chips, Sinclair fixed it. They have designed a flash hole reamer that evacuates the chips yet still indexes on the web of the case so that you don’t have to trim all your brass to the same length prior to reaming the flash hole. <span style="font-weight: bold">100 yard Tape Measure: </span> Absolutely invaluable for marking off yard lines and for optically checking your rifle scope. <span style="font-weight: bold">What to do if the brass fits:</span> Many times when we begin reloading for a rifle we will use new brass or brass that fits in the chamber without the benefit of resizing at all. This creates a quandary as to how to set up the dies to find the minimum amount of resizing. Often times it takes 1 – 3 firings of new brass (or new to the rifle) to get it to the point that it won’t fit in our chamber. Getting it to that point is difficult if we set up the dies to resize the case straight out of the box. The trick here is to resize the case only enough to get the bullet to hold on the seating process. Once again it is time for “Ye’ old Sharpie”. Color the top your case from the mouth down to about ¼” past the shoulder. Back the die out of the press until you barely feel any resistance at full throw. Turn the die down a ½ - ¼ of a turn at a time until you start to see the resizing die scuff the shoulder of the brass. You should have the neck almost fully resized by this time. Lock the die down. If you are keeping notes (and you should be) record the headspace length with your Head and Shoulders measuring set and go shoot. When you return you may or may not find that the case still chambers easily in your rifle. If it still chambers, color the shoulder and body again and see if the case is scuffed by the die. If it is, back the die out until you get to the point where it’s just not being scuffed and lock the die down and record your findings (don’t forget to cross out the previous measurements). You may have to repeat this operation several times to get the marker on the brass to be un-scuffed. Once you let the brass grow by firing until it won’t chamber or chambers with resistance, you can adjust the die so that the brass will “just” close smoothly or with a “slight” bit of compression or none at all. Resize several pieces of brass to ensure that the brass is consistent and will feed smoothly, there is spring back even in resize dies. Personally I like the bolt to close with no resistance as ambient weather conditions and chamber temperatures can change the dimensions of your brass slightly. Now is also the time to revisit all of your die settings to ensure that you are sizing the brass to the minimum amount, not only in the resizing operation but also in the bullet seating operation. Once again the Head and Shoulders as well as your Bullet Comparator tools will provide you with hard data as to what your dies are doing to your brass. Record your final findings, mark them as final, don’t forget the date. <span style="font-weight: bold">A Note on Notes:</span> As with most things precision, especially in the rifle world it is handy to have notes regarding what it is you are doing. To this end I have made up a simple drawing that allows me to quickly annotate the various dimensions of the cartridge I’m working on or more importantly the chamber it’s going into. It also gives me a place to record my load data once everything is finalized. These notes become important if you shoot several different rifles or don’t reload for a length of time. Combining this with the data from your rifle data book(s) you can keep track of any changes that occur in your rifle that require a modification of your load. For instance, you may need to adjust the ogive length of your cartridge to maintain accuracy as your barrel wears. <span style="font-weight: bold">Poor Man’s Stuck Case Remover:</span> If you reload for any length of time, sooner or later you will get a stuck case. It happens. Generally you notice the case is stuck AFTER you have ripped the rim off the case. Often time’s reloaders will be tempted to unscrew the decapping pin lock nut and drive the case out with a beating stick of some sort. The end result of this effort is usually a bent decapping rod and or broken pin which really puts a crimp in your day. The way most resize/decapping dies are set up you should be able to unscrew the decapping rod from the die and get the pin out of the flash hole. From here it is simply a matter of drilling a larger hole in your brass so you can tap it to accommodate a machine screw/bolt of some type. In general I use a ¼” – 20 TPI tap with a 13/64ths or #7 drill bit. Once you have the hole bored out and the threads put in it is a matter of using one fender washer and a 3/8” drive socket that fits on the shoulder of the die but not on the case (a ½” socket works well for .308 and smaller case heads). On some case/die combo’s you may need a socket that will rest on the lock nut (a 7/8” deep well usually works) if there isn’t sufficient room on the die shoulder for the socket. Put the screw / bolt in the fender washer and put them into the socket base and then screw it into the case. Using the appropriate wrench it will draw the case out of the die. You can either put the die in a vice or put it back in the press as you probably will not be able to draw the case out by holding the die in your hand. I keep a dedicated set of these tools in my reloading stuff so I don’t have to hunt around the workshop to find a washer, bolt, socket and my tap set which just adds to the frustration of the moment. <span style="font-weight: bold">Bullet Comparo or “The Ogive story”:</span> Much has been discussed regarding the relative merits of seating bullets to ogive length verses just seating to Over All Length (OAL) or more specifically SAAMI OAL. This came into sharp relief recently when helping a new reloader develop ammo for his new rifle. In this particular case a 300WM. SAAMI OAL for the 300WM is insanely short IMHO and most factory chambers (Remington in this case) are far and away longer than the SAAMI specs. We found the lands via the Sharpie and chamber method. The end result was an OAL about 0.30” longer than the reloading manual said it should be. This never even raised an eyebrow from me as I expected as much. My new reloader called me in a panic the next day thinking that we had done something wrong in the process (probably also thinking that I was going senile). I was fairly certain that we hadn’t but it caused me to revisit the procedures and double check the notes that I had taken. Better safe than sorry and I’m not above admitting when I screwed up. The result was that I hadn’t screwed up and that he had ammo custom fit to his rifle chamber, as was the intent. It just didn’t match the book, which is what caused his distress. Ogive length loading is vital to the consistency of the reloading process. Since we know that total bullet length versus ogive length is not consistent from box to box (or even from bullet to bullet in the same box) measuring the OAL is not beneficial to consistency. Ogive measuring ensures that the amount of “jump” or “crush” is consistent in relation to the bullet and leade interface (the leade is where the lands start). One problem that may be encountered is when the leade is so far down the barrel that the cartridge will not fit into the magazine box or the magazine proper. The choices at that time are to make ammo to be single loaded or make it so that it fits in the magazine with a consistent amount of jump. The only other choice is to have the barrel set back and rechambered, but that’s not what we’re looking at here. When doing load development I will often find the lands and then push the bullet back 0.010” and use that as a baseline while playing with powder charges. Once I find the appropriate powder charge I will then play with the Ogive Length to “round out” the groups. Often times it will also significantly shrink the group size. <span style="font-weight: bold">Full length resizing:</span> I am still convinced that full length resizing is the way to go for reloading ALL rifle and pistol brass for most reloaders. The primary focus of resizing is to ensure 100% reliability of feeding and chambering, PERIOD. My contention is based on the concept that I may be in a situation that requires a rapid feed/chamber and I should not have to consider that due to the vagaries of machining and ambient conditions that I may not be able to close the bolt. Bushing dies do present an interesting argument but as with the pretext of this article I’m looking for cost vs. benefit. The principle behind a bushing die is that you can control the neck tension of the brass via interchangeable bushings. OK I’ll buy that, but what happens when you change brass or your brass grows and you have to trim? Where did the brass you trimmed off come from? Simply put you’ll need additional bushings for various conditions and brass, AND you’ll have to figure out when to use them. As before I feel that with the absence of resizing the interior of the neck via a mandrel and subsequent external neck turning a bushing die has little to no advantage over a conventional die. As much as I dislike trimming the length I’m thinking I’d enjoy trimming the neck even less. Cost vs benefit and time & effort, you’ll have to decide if it is worth it to you. <span style="font-weight: bold">Expanders: balls, ovals and rods:</span> I have done some significant experimenting with the concept of expanders in the process of resizing. The purpose of an expander ball, oval or rod is to ensure that the inside diameter of the neck of the cartridge is consistent and that the inside of the neck is round. The problem that is encountered during resizing with an expander is that the forces of friction on the neck often results in and inconsistent shoulder as the case is pulled back over the ball / oval. The variance is in small degrees and measurements, but it exists none the less. To try it yourself, pull the expander ball and measure the headspace length of a resized cartridge vs. the one with the ball. The most consistent fix is to lightly polish the expander ball to a bright finish and adjust the ball so that at full resize it is just below the neck/shoulder junction. (DO NOT get the ball into the neck it will mechanically lock your die up.) This is where I find the least impact and most consistent and minimal change to the headspace length. The cure would be to have a “resizing rod” that resizes the inside of the neck at the same time the case is pushed all the way into the die. Unfortunately I have yet to find one that works “universally”, as this essentially would be a “forming” die. This concept would create many additional issues to deal with, most significantly the mechanical “lock” that would result from the process. The Lee resizing die expanders are the closest to this concept and are very effective. <span style="font-weight: bold">Books, Reloading Manuals and CD’s (Knowledge is power):</span> The need has not changed; reference material is required to perform this pursuit to any degree of success. The information however has progressed insomuch as technology, cartridges, powder and projectiles have progressed. Current manuals are significantly advantageous when dealing with new components. That being said old versions of manuals are singularly interesting for their comparative aspects. Somewhere along the line I mentioned to a friend of mine “never throw away an old manual”. He recently commented on finding the use of a particular powder for his 280AI in a 1988 manual that is no longer discussed in current manuals. This powder turned out to have all the qualities he was looking for as well as some significant velocity and consistency gains. As with anything in marketing NEW is improved and therefore must be better (cough, cough), “old” is sometimes cast out as newer things fill up the pages of current texts. Remember, anything in print regarding reloading is scrutinized by lawyers to ensure the non-liability of the company. Standard cautionary statements of “start low and work up” apply here. <span style="font-weight: bold">Volume vs Speed:</span> I have noticed in many manuals that the faster powders will provide some advantage in speed but at the cost of case powder fill. It has been my experience, and now my pursuit, to match a powder to the fill volume of the charge. I like my powder charge to be right up near the neck/shoulder junction. This combined with bullet seating gives me nearly a 100% case fill. The effect is a much more consistent velocity as proven by the chronograph. Most of my velocity spreads are in the low “teens” for a 10 shot test. A recent test with a new powder certainly showed significant velocity increases but the case fill resulted in an ES of 63 fps, too much for my tastes to run the long line. A Note on ES and chronographs: The better chronographs out there have a velocity error factor of 0.005 +/- fps. Pretty small right? Multiply that times 2700 (or your average velocity) and you will get 13.5. This tells me that an ES of less than 13.5 is within the error value of the chronograph. Something to think about. As you read this you will probably wave figured out that I continue to look for better mouse traps and tools to improve or speed up my reloading efforts, hence the new bits of kit. I also addressed some reoccurring questions that were brought up from Reloading 101. I hope you enjoyed reading it as much as I enjoyed writing it. Hopefully a mod will see fit to sticky this. How about some info for us gas gun guys. How do we ensure that we have the sizing correct. As we have to "drop the hammer" for lack of a better term to chamber the brass. Any tips on how to get this done without sticking a case in a auto gun. Gas guns are a slightly different animal than a bolt gun. 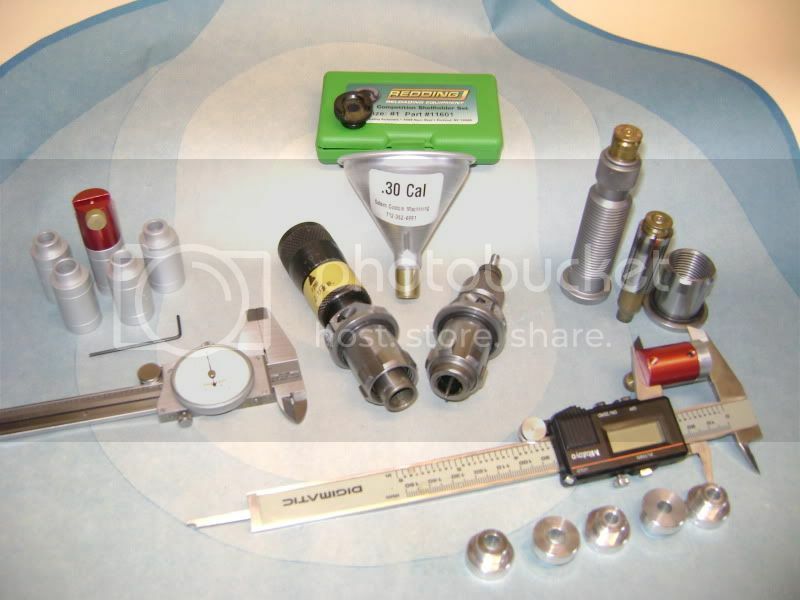 You need to ensure that not only the round fits smoothly into the chamber but ensure that the port pressure for a particular type of gas gun is not too high. The M1 Garand, M1A and Carbines are very susceptible to bending the op rod or cracking the gas block if over pressured. Modern AR platforms are a bit more robust in this area due to the direct impingement system. I'm not familiar enough with piston systems to comment. In AR type rifles you must pay particular attention to the primer and case head when looking for pressure signs. Since the AR bolt actually rotates prior to unlocking and extracting too much pressure too fast can literally rip the case head off while the cartridge is still expanded in the chamber. One of the effects of upper pressure is called "swiping" where the case head shows signs that the bolt has rotated across it while unlocking. This is a sure sign the case didn't turn in the chamber and the bolt was unlocking too soon. One should work very carefully in the upper ends of the pressure realm on gas guns. Case head separations in gas guns can be quite exciting as usually the bolt is unlocked and moving back while the "boom" is still occurring. If the "boom" happens out side the steel part of the rifle, the aluminum parts don't stand much of a chance. Conventional wisdom says you should always use Small Base dies for gas gun ammo. I have known too many people, myself included, that use regular dies to give this much credence. Unless your particular rifle has a tight chamber. As far as chamber checking your loads for fit and function, just take out the firing pin. If you chamber a round and it locks up the gun you need to resize some more until it fits and functions. Not much more to it than that. Don't know if that answered your questions but it's what I do and consider when loading for my AR-10. I just want to say thanks for producing all of the reloading articles that you've posted here. As someone who is new to reloading, all of the information that you posted was invaluable to helping me have a safe and positive experience learning how to reload. I've been wringing .25" groups out of my rifle as a result of learning from your posts and, as an added bonus, I've been able to avoid blowing myself or my rifle up in the process. Damn good articles there, Doc! I'm going to direct a couple of reloading newbies to them, it will cut <span style="font-style: italic">way</span> down on their questions. I agree with all of your conclusions. They jibe consistently with what I've been able to interpret from my own experiments over a number of years. While I don't play any games with ogives, I desist with the knowledge that there's some accuracy to be found there that I'm deliberately ignoring. My substitute fetish involves neck tension. I take a stab at regulating/managing it by backing off the F/L die and adjusting the amount of neck length getting sized in accordance with the marginal inability to spin a seated bullet between index finger and thumb. There's some direct feedback inherent in the process that turns neck tension into something a bit more substantial than by guess and by gosh. True F/L resizing only takes place once bolt closure drag on a significant percentage live rounds becomes significantly noticable. Ok DOc here is another one for you. Lets talk about OGIVE and OAL. And of course for a semi gun. SO the spec on a 308 is 2.800 AOL, however based on different bullets you will need to change this for Ogive however you are back to trying to get the bullet to fit the mag. By the way 2.800 is VERY close to my stock DPMS mags and the Mag puls as well. They are feeding fine but there is only about .020 room. I may need to bump them back. I started checking length on a few others stock loaded rounds anywhere from 2.750 up to the 2.800..
On an AR platform or any other mag fed gun you will be limited by the length available in the mag. Period, no other way around it unless you single load and that's a whole different animal due to port pressures. Since you are limited to maximum length your only option is to play with the OAL in REVERSE. In other words seat them deeper and see what they do. Same procedure as when you can get to the lands just go back up to say 0.20" in increments and see if you can find a sweet spot. If you can find something take an ogive measurement of THAT round and load to that ogive. Assuming that you have sufficient neck tension to hold the bullet still during recoil in the magazine, you will be golden. Ogive measurements work every time and if it fits in the mag so much the better. Depending on what you find you may be forced to look a tangent ogive bullets to achieve sufficient neck to bullet contact IF you start pushing them back a ways. One other consideration if you do seat deep is the compression of the powder. If your already at max fill you way wish to drop the powder charge and do load dev with the bullet seated as deep as you are willing to go (or halfway) and tweek the charge. Buy yourself a little breathing room in the magazine and play with it that way. Just registered. Been reading and learning here for a long time. Out of all the reloading info on the net, I've learned the most here. Thank you all. I'm ready to buy equipment and have made most of my decisions. In the past, I've never regretted spending more and buying perceived quality, same here. I'll be loading for 22-250 and next year will add either 6.5 Grendel or 243WSSM. I'm ready to buy either the Lee Classic Cast single stage or Forrester Co-Ax. Cost is not my deciding factor. I know I'll enjoy the detail work of hand loading. One more round of press opinions for my situation please? Either way, I see the benefit of the Hornady lock n load quick change system. Can you guys look at these links and confirm what I need to buy for the simple die change? Are these the two items I need to add to my dies? If not could someone provide exact product names or links? Also dies, I'm an intermediate shooter. Cost isn't my deciding factor, precision is. Lee dies, or Forrester, or Redding. One of my goals is to not need or want to upgrade down the road. I have no question I'll enjoy handloading, can't sleep at night thinking about it. Thanks guys, I really appreciate you time. Great Great stuff - you could compile this, write a book, (which you have already done) and sell it, and I would promptly buy it! Thanks so much for the great info - its helped me immensely. On presses I am partial to all the things the Redding Big Boss II offers, size of opening, orientation, ease of operation and MOST importantly the spent primer drop tube feature. NO MORE PICKING UP SPENT PRIMERS. The 2 items listed will get you rolling with quick changes for your single stage dies. <div class="ubbcode-block"><div class="ubbcode-header">Originally Posted By: Tomcat</div><div class="ubbcode-body">Great Great stuff - you could compile this, write a book, (which you have already done) and sell it, and I would promptly buy it! Actually there is a member here that has put both articles into a PDF file. If he chimes in he can send you a copy as they are very nicely assembled. Thanks for the update and posting it up for others. I found that it you copy what is written paste it into a e mail send it to your self it prints in perfectly from a e mail. I have a PDF program for some reason though it will not use many items.. I guess I ned to buy the pro version? Nice to read your update! Next range trip you make, remind me to discuss some of the variations that have worked for me. Also check out the Redding instant indicator comparator. I have found it to be one of my most prized reloading tools. Thanks, Big Boss II...Re-read your article and looked in my notes, just like you had said before, BBII. Thanks for you kind reply. My buddy who doesn't have internet, has been reloading for thirty years, and most importantly, will be in my shop guiding me, is pushing me to the Lee Challenger Breech Lock Single Stage Kit. Especially since it has it's own quick change bushings. I'd like to make him understand why I'm not using his press recommendation, but still want his personal guidance. Can you give me some points I can use to help convince him? Also, he uses the Lee turret. Any foder you can provide will help too. At my age, there really won't be any updating of equipment, so I'd like to start off with what you experienced guys ended up with. 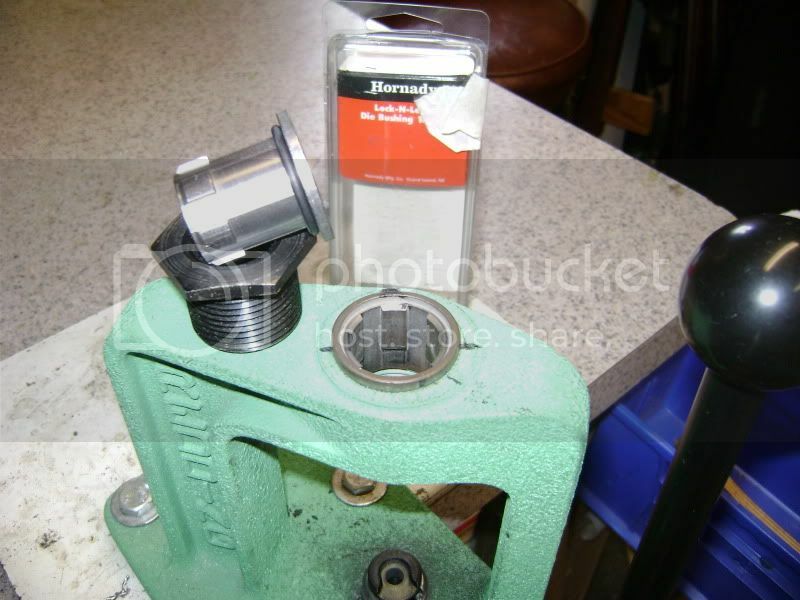 The Lee Breech Block is a simple and effective press for doing "occasional" reloading. Lee makes SOME good stuff I dunt care how little it costs (I still run a 3 hole turret press for pistol and have a Dillon 650 sitting in the corner). That being said it's pretty worn out. My kids-kids won't wear out that Redding. "The spent primer system is easy to empty", don't ever have to touch or chase one again w/ the BBII. The 1/2 hose goes right into the garbage can. You couldn't pay me to buy a kit. I've done it before and have boxes of "crap" that come with them. Of course this one DOES come with the Auto Prime and shell holder set. If I was only worried about cost I'd consider it but would wish I bought the Classic Cast before too long. I can't positively tell you that there is flex in the Challengers but IMHO they don't FEEL solid. I just really like the Redding now that I have it. One thing I am not fond of with Lee is the small footprint for mounting. I know it probably doesn't make a hoot but the triangle footprint of Lee's in general I find wanting. The BBII has a 36* offset so if your right handed things are much easier. The Lee CC & BB are straight. IMHO it's a dead toss up between the Classic Cast and the BBII as I've said, "It's all about the ergonomics". Thanks for taking your time again for entry level info. I'm starting with Hornady V-Max bullets. Other remaining decision is a beam scale. Seems like whichever one I buy, I need calibration weights. RCBS 1010 or 505 or 502. RCBS is closed today, and I'm trying to confirm the 1010 includes the weights. I believe the 502 and 505 do not. The only other one I'm considering is the Dillon Eliminator. Thanks for your time. I try to give of my knowledge also, when I believe that I know the subject. Great write-up, Doc. 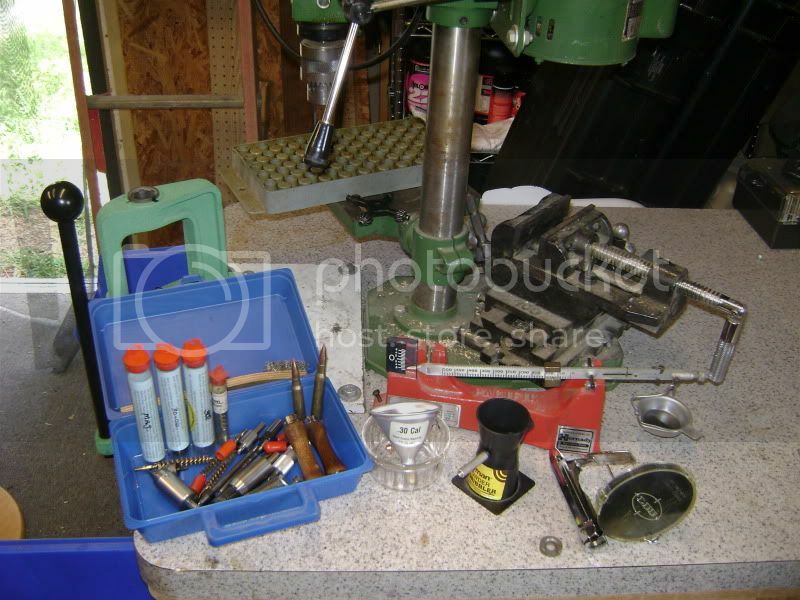 I've added many of those same tools to my reloading bench (Hornady lock-rings, comparators, etc). One thing I'd add is that the Lee Auto-Prime has sure worked better for me (and was so inexpensive) than the tube-fed primer seater that came with my Big Boss II. I do only a partial-FL resize for my bolt guns and also go with a charge that is nearly compressed. But like you said, when I load for a gas gun (e.g. M1 Garand) I go with FL and load to original specs for the ammo. No desire for a bent op-rod or other troubles. any particular reason you are looking for a beam scale?...I have one somewhere that has never been used. For years I used a small digital scale to set and confirm my charge weights. I have recently upgraded to the rcbs chargemaster. it is slower, but now i know that every charge is dead balls on. Its not cheap, but if you have the funds its pretty impressive. I'm going to start off learning with Lee dipper cups, a 502 scale, and the Redding trickler. After I find my hunting load and which powder, I'll make a decision to either get a top end throw or the Chargemaster combo. Doc, I want to apologize to you. You took the time to help me. Then, a couple of times I asked a question that you had already answered in a pervious post. I know how I would classify some so-and-so who didn't seem to read and retain my answers. No excuse, I blew it. I'm sorry. I just finished going back through all 236 pages and reading any post that might help me learn about my reloading. I printed enough posts to fill two four inch wide notebooks with ideas, solutions,and opinions. You, and several other regulars show tremendous patients with those of us starting out answering the same questions over and over. We all should have searched further back to find that our questions have been asked and answered repeatedly. Thank you again for sharing your knowledge. I showed my brother-in-law the advantage of using a drill press for case prep from 101 and his comment was, "why didn't someone tell me this sooner?" <span style="font-weight: bold">What to do if the brass fits:</span> Many times when we begin reloading for a rifle we will use new brass or brass that fits in the chamber without the benefit of resizing at all. This creates a quandary as to how to set up the dies to find the minimum amount of resizing. <span style="font-weight: bold">Often times it takes 1 – 3 firings of new brass (or new to the rifle) to get it to the point that it won’t fit in our chamber</span>. Getting it to that point is difficult if we set up the dies to resize the case straight out of the box. The trick here is to resize the case only enough to get the bullet to hold on the seating process. Doc, I was re-reading through both your 101 and 201 post on reloading and your paragraph above got me thinking.... Based on my Lapua brass issues and apparent HS problems from my recent thread you helped me with, I threw out all my old Lapua brass and I have 200 new pieces arriving on monday. 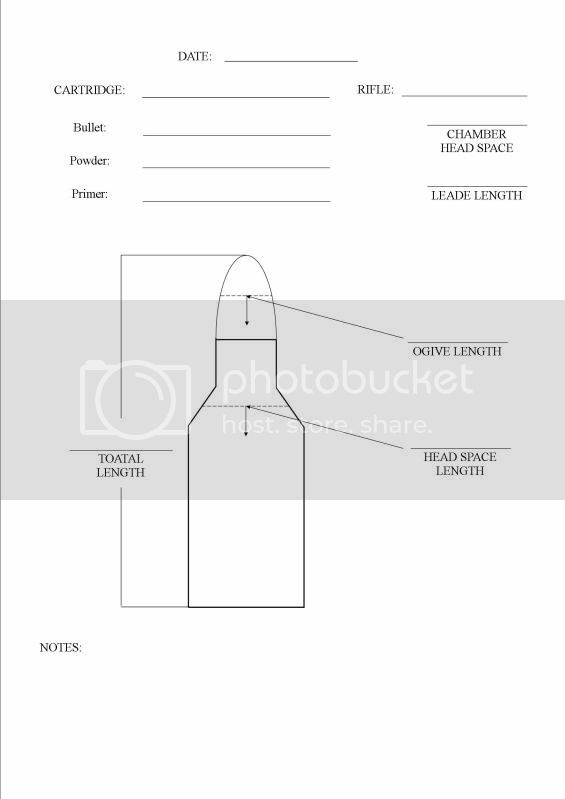 Anyway, my question refers to what I bolded above: Would I be correct in thinking that if it takes a couple of firings to get virgin brass to NOT fit anymore, could I just neck size for those first couple until it doesn't fit anymore and then go back to FL sizing setting up the die like you described in Reloading 101? Part 2 of the same question: If I have some fired factory WIN brass fired in this chamber and set the die up to bump the shoulder correctly as you describe, will that same die setting work on other brands of brass (i.e. my new Lapua)? Or will I need to go back and reset up the die again once my Lapua grows enough to not chamber? ... But, I could be wrong and maybe others will pipe in if it worked for them. Part one: I did exactly this same process when shooting lighter loads and only neck sizing until it didn't chamber. Once I started running a hotter load I could not do this, even with Lapua brass, and had to FL every time. Hmmm, I'm going to have to experiment with this, Swan. I don't doubt you for a second - but I'm having trouble conceptualizing the reason behind them being different. I get that all brass makes will have different <span style="font-style: italic">INTERNAL </span>dimensions, but I would have thought that by FL sizing them with the same die, the <span style="font-style: italic">exterior </span>dimensions will be exactly the same. And isn't it the exterior dimension of the brass that we are concerned with as far as headspace and chambering properly goes? Swan, in your post above where you said that the brass DOES make a difference - were you only neck-sizing? If I FL resize different brass with the same die, won't they come out dimensional the exact same on the exterior dimensions? Springback and differing alloys might contribute to this observation, but I am with Jeff on the internals being the source of difference. The die should make all cases the same, if enough lube has been applied. Using a <span style="font-style: italic">Redding body die</span>. I always did this first then neck sized, a two-step FL sizing, if you will. <span style="font-weight: bold">This could possibly be the source for some of the differences I am seeing?</span> I don't know. Measured with Sinclair bump gage/comparator, My 2x fired Lapua before sizing measure at 1.563" (shoulder measurement, duh). 1x fired Federal brass measured at 1.556". Ran all thru the body die and now Lapua measures at 1.560" (.003" bump, which is how I set it up). And the 1x fired Federal now measures at 1.555" (.001" bump). Now, what does this tell me? There is possibly room for error while measuring of course. By no means are these results conclusive. In fact, they confuse me even more. Considering how the die was setup for my Lapua brass to be bumped to 1.560" (I got this backward, as I mentioned in OP, btw) <span style="font-weight: bold">it should not even have touched the shoulder on the Federal brass</span>, I would have thought. But it did, slightly (.001"). No lube on the shoulders either. So, are you guys more confused or less? lol. The more n more I think about this I realize it may be due to the difficulties of consistently getting the same <span style="font-style: italic">repeatable</span> accurate measurements. Some springback may account for the difficulty of measuring accurately especially when dealing with very small measurements of .001". But I'm thinking that I was confused with my OP and the more I thought about it the more it confused me. Since my dies were stored and I couldn't immediately redo the experiment. Now I have a headache, thanks. Yep, I'm totally confused.....sorta. It occurs to me however that the amount of bump is irrelevant to this discussion. It is the final post FL measurement that we're concerned with. IOW, when you run any piece of fired brass through a particular die - does the re-sized brass come out of the die the same shoulder measurements? After Sat's match - I will run some Win, Fed, and Lapua through the same Redding FL bushing die and then measure all the shoulders afterwards. In theory, they should ALL be the same. That's my story and I'm sticking to it. I'm a big fan of the Forster Co-Ax after trying most of what's on the market as well. It's not the cheapest, but it's worth it to never wish you had something else. I do like the Hornaday locking rings better than Forster's rings, but use Forster dies whenever possible. I'll add some thoughts and observations based on the above conversations about brass and different brass. There IS a difference between manufacturers. Some of them are thicker/thinner, heavier/lighter, have thicker/thinner web's etc. Each mfg makes their brass their way and use different alloys to do so to achieve their goals. The result is that each case from a different manufacturer will react differently in your press. The differences my be infinitesimal but they will be there none the less. I have been blessed to have access to not only the same mfg'r but the same lot of brass/ammo for each of my precision rifles in quantity (mostly military match or match grade). In loading some hunting ammo and bunker ammo I have discovered what the above posters were referring to. Same die, same press, same shell holder, same lube, same day, different brass will result in different shoulder bumps (or cartridge headspace lengths (CHSL)). Why? My primary guess is in the alloys used to make the brass will "spring back" slightly differently for each manufacturer. I have noticed that this difference depends greatly on the number of times the brass has been fired. The more times fired the less difference in CHSL. Why? the popular term is "work hardening". For instance, I have a can of Federal GMM brass from the early 1990's, this stuff is "soft". I say soft because even w/ standard loads (44.0gr of Varget and a 175/178) after 2 or 3 firings the primer pockets get loose. That is opposed to LC Match brass which is "hard" 50+ reloads of the same charge and they still run strong. The LC brass is very consistent and nets minor variations of 0.005" or less per bunch. The Federal brass is all over the place to the tune of 0.010" per bunch (that's 0.005" +/- the standard). What's a shooter to do? Well you have several choices. First Choice: Get good brass, and a bunch of it, and reload it as a batch. IMHO 500 rounds is a pretty good number and will cover most competitions easily. By the time you get to 10 reloads you have 5000 rounds down the tube. Second Choice: Deal with the variation and load to the lowest common denominator. Read that, load so that every round chambers. Some will be bigger and some will be smaller but they will all function. This is about like buying your ammo but with better powder and seating control. Somebody is bound to ask about weighing brass. After all if all the brass weighs the same, it has to be the same, right? I was at the range when a young(er) lad shows up with a nice stick and what is obviously handloaded ammo. We're banging away at the 300 yard line and conversing as shooters do about how we reload etc. He was saying all the right things, weigh each charge, uniform case prep, ogive seating he even weighed the cases and the bullets. OK cool. Down at the target end I couldn't help notice he had a killer group, about 1" wide but it was 4" tall. I had been watching him shoot and I was fairly sure his position was good and he wasn't breathing through the shots. WTF? He mentioned that he had been frustrated with this rifle since he started loading for it, FGMM would group inside a 1/2 MOA but his reloads would string. Again, WTF? Back at the line he pulls out a box of FGMM and proceeds to shred a 1" pasty (300 yds remember). Then he goes back to his hand loads, one high, one low, 2 in the middle, one higher, etc... pretty quickly he's back to a 4" tall group. Ummmmm (free trigger time) OK! I do as I normally do, record each shot and put them back in the box, nose down a$$ up in the order fired. 5 rounds later I have a 3" tall 1" wide group. WTF? "Lemme see something" I pulled 4 R-P rounds from his box and shot a very nice 1" X 1" ish group a bit low from POA. He got back on the gun and I handed him 5 Fed rounds. Another 1" X 1" ish group a little high. He came off the gun with that deer in the headlights look. "But they all weigh EXACTLY the same." "Yes, but weight does not equal volume and volume is what gives you the consistent pressure." Consistent pressure = Consistent velocity = Consistent POI down range. In comparison to all the things you spend money on with a rifle, brass is cheap. Get good brass, and get it all the same if possible. More importantly, get a bunch of it. If you are so inclined, do all your case prep and then sort the brass by weight. Load the high and low end brass and see if it makes a difference on the target at a distance. If it doesn't then load it all. If it does cull the outside brass by weight until it doesn't and carry on happily knowing you have removed a variable. Yeah funny, would have been interesting if it was real though!! <div class="ubbcode-block"><div class="ubbcode-header">Quote:</div><div class="ubbcode-body"> Expanders: balls, ovals and rods: I have done some significant experimenting with the concept of expanders in the process of resizing. The purpose of an expander ball, oval or rod is to ensure that the inside diameter of the neck of the cartridge is consistent and that the inside of the neck is round. The problem that is encountered during resizing with an expander is that the forces of friction on the neck often results in and inconsistent shoulder as the case is pulled back over the ball / oval. The variance is in small degrees and measurements, but it exists none the less. To try it yourself, pull the expander ball and measure the headspace length of a resized cartridge vs. the one with the ball. The most consistent fix is to lightly polish the expander ball to a bright finish and adjust the ball so that at full resize it is just below the neck/shoulder junction. (DO NOT get the ball into the neck it will mechanically lock your die up.) This is where I find the least impact and most consistent and minimal change to the headspace length. <span style="color: #FF0000">The cure would be to have a “resizing rod” that resizes the inside of the neck at the same time the case is pushed all the way into the die.</span> Unfortunately I have yet to find one that works “universally”, as this essentially would be a “forming” die. This concept would create many additional issues to deal with, most significantly the mechanical “lock” that would result from the process. The Lee resizing die expanders are the closest to this concept and are very effective. I reload for a .264 Winchester Magnum and have a standard Redding 3 Die set plus a Competition Seating Die. The FL resizing die with the expander ball routinely makes all the nicely prepped brass complete crap as far as runout is concerned. I've tried adjusting it with many methods but just can't size a case and get zero runout at the neck. The sizer also gives me waaay too much neck tension. I didn't want to buy a Competition Type S Bushing die which would be the way to go because of the added cost, so here's what I do. I now size the case without the expander/decapping rod. I have purchaced the Sinclair Expander Die and Expander rods that are a little oversized and after running all the brass through the sizer I use the expander die to expand the case neck. The result has been perfect concentricity and just the right amount of neck tension (.002") for my loads. I have purchased expander rods for all of the calibers I load (7.95$) with standard dies. Thanks Doc for all the time you have taken to help out everybody!!! Thanks for this great article, I'll recommend it to anyone looking to learn more. I've got on qurstion though: What brand of FL dies do you recommend? I'm looking for a good die set for my 30-06 Garand and don't want to pay extra money for unnecessary feature. thanks for the info here doc. new to hide & reloading. u have given me a lot of things to consider & read about. i've started reloading for my ar10 & 15, while my bolt build is in progress. i have some good mentoring, which has been a god send! many of the things you bring to light in "reloading 201" are just as my mentor has taught me. i am amazed @ how much there is to be learned r/t reloading. your posts are a great way for me to learn, so thank you for your time in writing them. Most any FL dies will work. Where you want to spend the money is on the seating die. Get one with a micrometer head and it will save you MUCH frustration when seating to ogive length. Personally I like Forster but Redding and RCBS both make good ones.